Foton was a series of Soviet and later Russian material sciences research satellites. 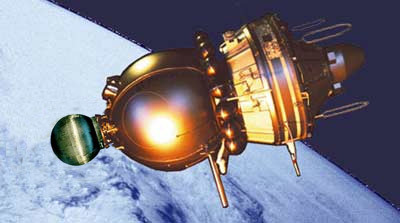 The Foton program used initially a modification of the Bion satellite, which was derived from the Vostok/Zenit design. These satellites, consisting of a spherical return capsule, a service module and a battery module, offered the opportunity for dedicated microgravity research missions of up to 16 days duration. Foton spacecraft had flown with the Zona-1, Zona-4, Zona-4M, Splav-2, and Konstanta-2 electric furnaces as well as the Kashtan electrophoresis unit. Also other payloads were flown, among them biological experiments. The 11th mission was unusual, as the battery module was replaced by the German Mirka reentry capsule experiment. Twelve missions were flown, all launched by Soyuz-U boosters from the Plesetsk cosmodrome. The Foton series was replaced by the improved Foton-M satellites.